A TAN MAKES YOU LOOK HEALTHY ENERGETIC AND ATTRACTIVE! Now you can have a rich golden-bronze tan year-around without cooking and prematurely aging your skin in the sun! In Canada and Europe, millions safely acquire gorgeous, deep tans simply by taking 4 to 6 tanning pills daily of the 30mg Canthaxanthin tanning tablets until they are as dark as they wish to be. Then they maintain their tans with 1 to 3 tablets per day. Even if they are already tanned, it makes their tans deeper and richer. If you are fair-skinned and hard-to-tan, this is especially for you. USER REPORTS ARE FAVORABLE, INDICATING THAT A GOLDEN BRONZE TAN CAN BE ACQUIRED IN A FEW WEEKS. 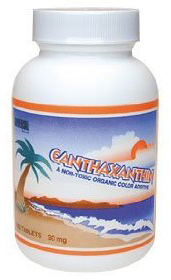 Canthaxanthin is an all natural, organic, nutritional supplement. Not only found in Tanning Pills also found in many plants, it's what gives the red color to many fruits, vegetables and flowers. Manufacturers use it as a non-toxic food coloring for many items such as fruit drinks, spaghetti sauce, and bar-b-que sauce. People taking Canthaxanthin as a nutritional supplement have noticed a pleasant side effect. Canthaxanthin can give color to the second layer of skin known as the subcutaneous (fat) layer. Since the top layer of your skin is transparent, it can give the appearance of a natural-looking golden-bronzed tan, evenly spread throughout the body - minus the ultra violet exposure associated with sun tanning and indoor tanning beds. Many use tanning pills with tanning beds or outdoor tanning for an even deeper bronzing. If you use canthaxanthin, keep in mind that it offers no protection from ultra-violet radiation from the sun or tanning beds. Although Canthaxanthin is approved by the FDA for use as a food coloring or as a vitamin/nutritional supplement it's use as an oral tanner has not been approved to date,and they do not allow companies to market it as an oral tanner. The following guidelines have been approximated based on adult body weight. The tanning pills should always be taken at the end of each meal throughout the day (during and after the saturation period). The saturation period is approximately 4 weeks. Saturation is achieved when the body has obtained an golden/bronze color easily detected in the face, hands and feet. Coloring starts to appear 1 to 2 weeks before saturation is completed, which means you may not see any color for the first 2 weeks. Once the saturation point has been achieved, cut the dosage in half. You can then regulate the coloring by taking more or less tanning pills on a daily basis as needed. A) NOT EVERYONE reaches saturation in the same amount of time. Some may take longer because of various reasons (obesity, poor assimilation, hereditary skin thickness, poor health, etc.). If Saturation is not reached by 20 days, you can take 2 or 3 more tanning pills per day. This may be needed to reach saturation in your case. B) Once saturation is reached and the dosage is cut in half, you can regulate your color by taking less or more tablets. C) How are the tablets taken? This is VERY IMPORTANT! The tanning pills need to be taken after each meal throughout the day for maximum absorption. The best example is: one after breakfast, one after lunch and two after dinner (or the largest meal). D)How much canthaxanthin will I need? This depends on your body weight. Other Side Effects: Canthaxanthin will turn the stool a reddish color. This occurs when the body expels excessive amounts of Canthaxanthin that cannot be assimilated. Also, excessive amounts (more that can be absorbed by the body fat) may turn the palms of the hands and the bottom of the feet an orange/bronze color, indicating that the dosage should be reduced. The orange tint on the palms and feet will gradually become less noticeable after the dosage is reduced. Results may vary with each person. Some people need higher dosages during the saturation to achieve the same results with Tanning Pills.